A simply designed machine, that combines traditional robustness and reliability with the most evolved technology. Saurus939 has always been the core business of Italvacuum, one of the leading manufacturers of vacuum pumps as well as a worldwide reference point in the design and manufacture of vacuum dryers. Resistance, strength and consumption of oil virtually eliminated thanks to the innovative LubriZero® system that guarantees perfect operation and optimum results with total respect for the environment. Saurus939 has no fear of aggressive and corrosive solvents, powders and condensates, or distillation by-products. But above all it does not fear confrontation because it is designed and manufactured to work 24 hours a day with a constant excellent performance and minimum operating costs, thanks to a low-energy motor, negligible oil consumption and easy, immediate maintenance. Powerful, efficient, but absolutely safe: Saurus939 guarantees optimum safety through the whole process and complete purity of the final product. In other words, ensures an uncontaminated vacuum. Processes: vacuum drying, reaction, distillation, crystallization, filtration, evaporation and polymerization. The design is simple and traditional. 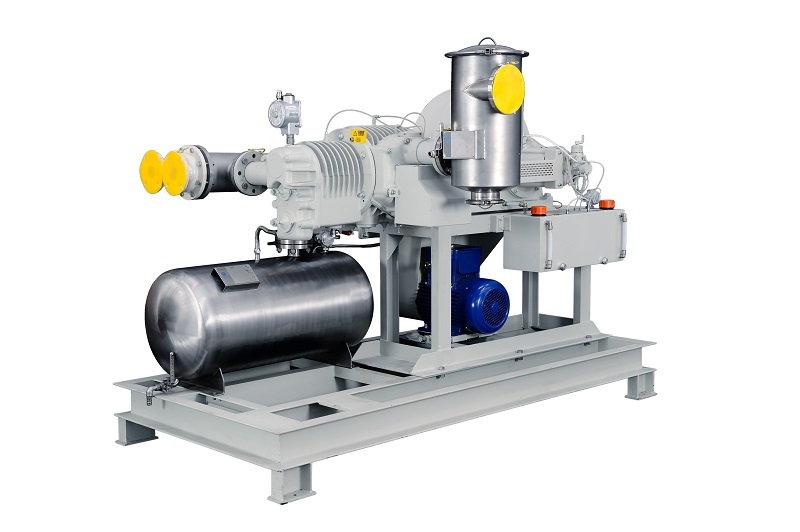 The great added value is Italvacuum’s consolidated experience that year after year has perfected, innovated and improved the Saurus939 vacuum pump, guaranteeing optimum operation in all chemical and pharmaceutical processes, such as drying, distillation, reaction and crystallization. Saurus939 can intake both the vapours of common solvents (methyl alcohol, ethylic alcohol, chloroform, acetone, ethyl acetate, methyl chloride, benzene, toluene, isopropyl alcohol, ethyl ether, heptane) as well as those of more aggressive solvents (hydrochloric acid, acetic acid, chlorobenzene, dimethylformamide, acrylonitrile, dichloroethane, cyclohexane, pyridine, dimethyl sulfoxide, dichloromethane). Cylinder, pistons, piston rings and head are made of special anti-acid cast iron. The other components are made of cast iron, special steel and PTFE with special charges. The pump is completely sealed: a characteristic that makes it extremely reliable and efficient for a long time, even in damp and dusty environments. The discharge valves have automatic openings and are available in different materials, including Hastelloy. Saurus939 is equipped with the exclusive LubriZero® system that ensures best possible performance with truly negligible oil consumption, completely compatible with the environment. The LubriZero® system combines the metered injection of oil with a kit of new materials in PTFE with special charges that are not only resistant to corrosion, but require virtually no lubrication. This also allows for the use of synthetic FDA approved oils. The metered flow of a few drops of fresh oil (about 10g/h) guarantees an effective barrier from even the most aggressive solvents, considerably increasing the duration of the perfect cylinder-piston coupling and hence the working life of the vacuum pump. Powerful, resistant, efficient, but also completely safe: Saurus939 guarantees maximum safety throughout the whole process and complete purity of the final product. In other words, guarantees uncontaminated vacuum. In fact, during the entire work cycle, not even one molecule of oil reaches the processed product. This is certified by the department of material science and chemical engineering at the Politecnico of Torino, as part of specific research carried out on a complete process of vacuum drying. The results leave no space for doubt: the final product is absolutely pure with no risk of oil contamination in the process. Better quality is never an expense: it’s an investment. And investment is always rewarded with good results. Over time the Saurus939 vacuum pump, achieves more, lasts longer and has lower running costs with respect to other main technologies for vacuum systems. The use of oil not only avoids any contamination in the process, but also improves performance and increases pump life, reducing maintenance costs, even in the presence of very aggressive solvents. The choice of materials, technology employed and the appropriate solutions taken by Italvacuum in every design detail make Saurus939 the best in the sector, with reliability and results beyond comparison. Saurus939 range includes single stage and double stage models. Double stage models are also available with one or two compressor roots in order to increase the pump rotation speed and reach lower final pressures (high vacuum levels). Support base for easy, fast installation. The standard version, CE εx II 2G T4/T3, is suitable for installation in an area classified as ZONE 1-GAS and temperature class T4 (135°C). The Saurus939 special version can be supplied with ATEX certification up to ZONE 0-GAS (internal pump), ZONE 1-GAS (external pump) with three different classes of temperature T4 / T150°C / T3.